* Mariell's top-selling CZ wedding earrings are now available in genuine Rose Gold plating with Clip Backs! * Our stunning Clip on earrings are 2 1/4" h & are sure to turn heads at any special occasion! 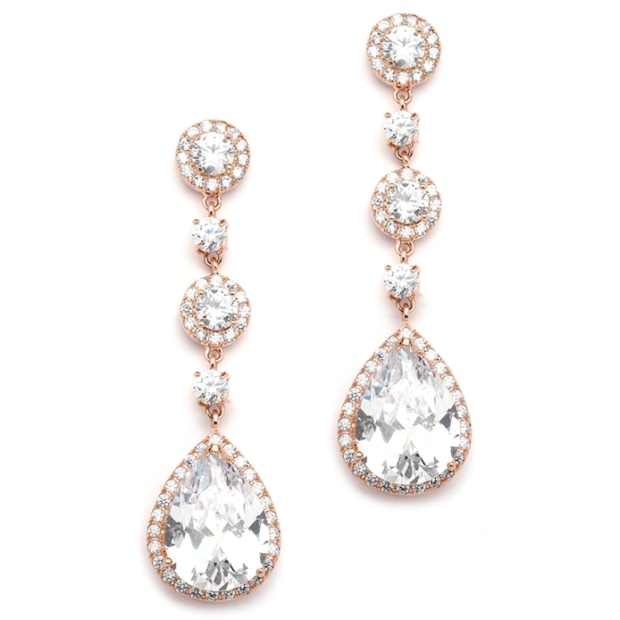 * These earrings are a guaranteed bridal favorite! * Mariell's best-selling Clip on Cubic Zirconia bridal earrings feature pave framed rounds which dangle into a brilliant pear-shaped drop. * These top-selling clip earrings are available for the first time in genuine Rose Gold plating and is sure to be a hit with brides looking for blush gold jewelry to accessorize their wedding gowns. * This style is a proven bridal favorite so be sure to keep it in your store showcase. * These Clip-in earrings are also available in Pierced as style 400E-RG and have a matching necklace style 400N-RG, sold separately.